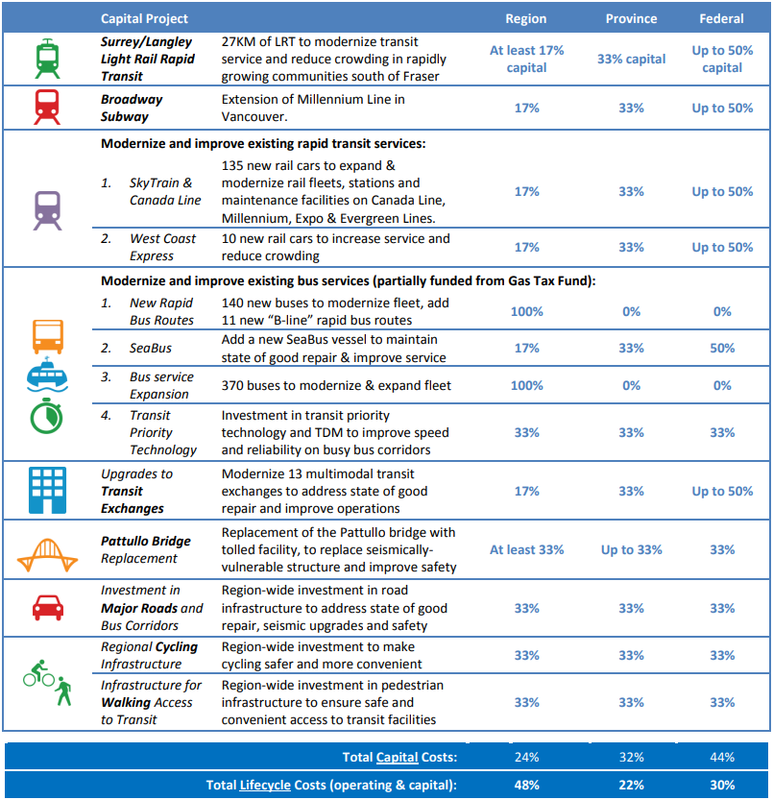 The South Fraser Blog: Two-thirds of TransLink 10-Year Investment Plan now approved in principle, plus getting to 100% funding. Two-thirds of TransLink 10-Year Investment Plan now approved in principle, plus getting to 100% funding. On Friday afternoon, the provincial government and the Mayors' Council on Regional Transportation announced that they had come to an agreement in principle to fund phase two of the three phase 10-Year Transportation Investment Plan. The following map shows the location of the expected investments. 10-Year Investment Plan map. Select image to enlarge. 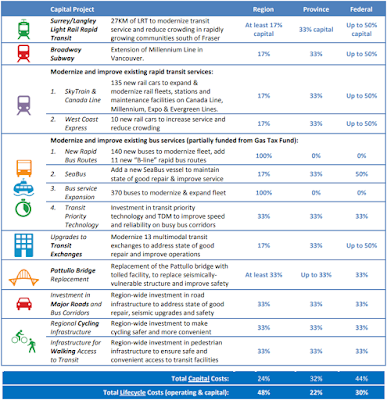 The following table shows a more detailed view of the transportation investments for our region over the life of the plan. 10-Year Investment Plan details. Select table to enlarge. 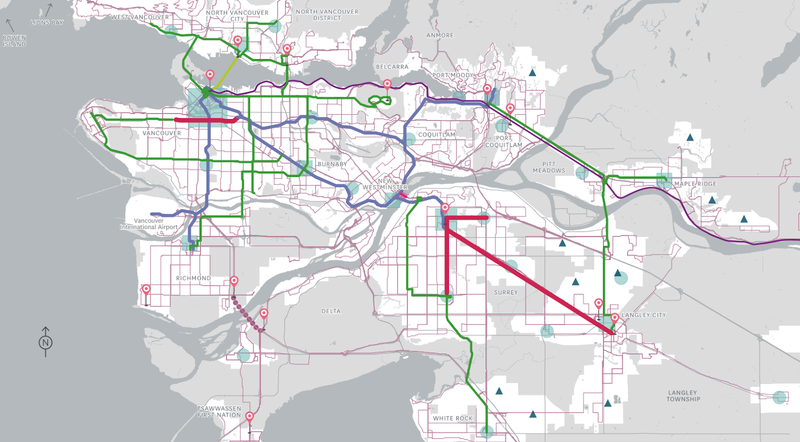 Phase one of the plan was funded by a bump in property tax, fare increases, and from TransLink internal revenue sources. Another proposed funding source was a regional development cost charge, though this was not implemented at the time phase one started moving forward. Phase two investments are to be paid for with another increase in property tax, additional bumps in transit fares, the regional development cost charge, and an increase in parking lot sales tax. This is in addition to TransLink internal revenue sources. New funding sources for phase two of investment plan. Estimated annual revenue. The parking lot sales tax is charged whenever you pay for parking in a parkade or surface parking lot. The new source of revenue is the development cost charge for transportation. This charge will be levied on new construction in our region. The original plan was to have the development cost charge set to generate about $20 million in revenue per year. The latest information states that it will generate around $7.5 million per year. 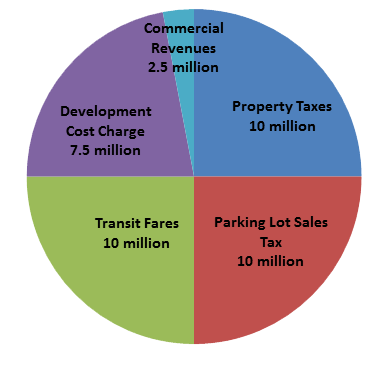 Implementing the new development cost charge will require a change in provincial legislation, as will the increase in parking lot sale tax. This increases in revenue still doesn’t close the funding gap for the full 10-Year Investment Plan. One of the asks from the Mayors’ Council has been for the province to contribute annually to help offset the operating costs in the plan with a provincially-controlled source. This is shown in grey on the following graph. 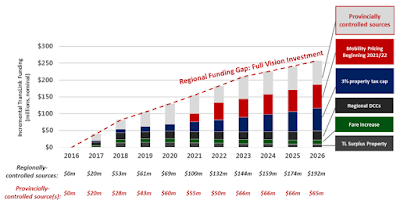 Funding gap for 10-Year Investment Plan. Select chart to enlarge. TransLink was originally going to replace the Pattullo Bridge. Tolling was going to be a revenue source, but it would still have to be subsidized. The Golden Ears Bridge and the Port Mann both cost more to operate than they were receiving in tolling revenue. The Pattullo Bridge would have been no different. The 10-Year Investment Plan included the cost of the new Pattullo Bridge. Last month, the province announced that it would take over the Pattullo Bridge replacement, plus own and operate the new bridge. This helped close the “provincially-controlled source” funding gap. At Friday’s press conference, the province said that it would further relieve financial pressure. It was mum on how, but I think that most people can take an educated guess on how. As long as the province is able to get enabling legislation passed to fund phase two, all that remains is funding phase three. While I don’t have the exact numbers, it seems that the “provincially-controlled source” funding gap will be plugged. 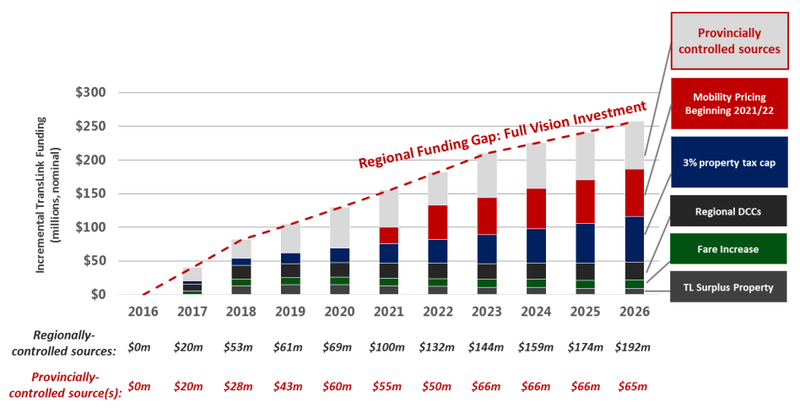 By 2021/22, the Mayors’ Council wants to implement mobility pricing with $50 million per year, growing to $75 million per year, used to fund the full investment plan which includes light rail to Langley. 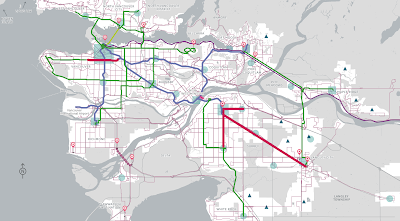 With significant federal dollars committed to projects like Fraser Highway Light Rail, I am hopeful that all levels of government will once again be willing to work together to fund the full investment plan.